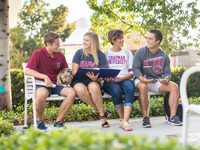 Chapman University isn’t just an institution of higher education, it’s a family. When you step on campus you can feel that there’s just something special about this place: it feels like home. 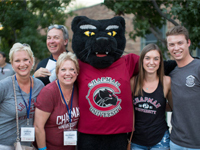 From the minute you make the decision to become a Panther, you’re welcomed into the Chapman Family: a close-knit, caring community of people who will root for you and help you find success at every step of your journey. Highly motivated. Academically gifted. Vibrantly diverse. Socially responsible. Chapman students are truly the total package. Creating an incredible Chapman Experience is at the heart of everything we do. Our leaders are bold and ambitious, our world-class faculty and instructors are personally committed to your success, and our staff members always go the extra mile to help our community thrive. More than 50,000 alumni across the globe are shaping industries, leading organizations and building communities. Get connected to our network and take advantage of exclusive events, benefits and discounts, and career support for life. 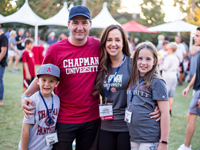 Parents and families of students and alumni are essential partners with Chapman University. 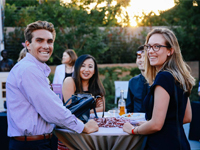 Whether your student is a freshman or graduated decades ago, you can take an active role in the Chapman Family by volunteering, attending events, hiring Chapman students and graduates, and more. From neighbors to donors to local businesses and organizations, our community thrives because of the involvement of friends of the University. 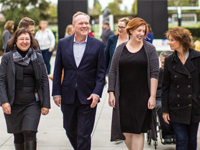 They're cheerleaders, benefactors and passionate ambassadors for Chapman in the community.